Step your eggs Benedict and breakfast-sandwich game up with these otherworldly buttery muffins. “My favorite thing to do with the homemade English muffins is make a banana, peanut butter, and honey sandwich,” says the chef. “I toast the muffins and then smear on the peanut butter when they’re still hot, and the peanut butter melts out of the sandwich.” The chef treats himself to a PB&B every morning after biking 30 miles to the restaurant. If you, like a lot of home cooks, are terrified by bread-making—don’t be. “People will try to be gentle with dough,” says Mahin, “but the more you move it and the more you mess with it, the better it will turn out.” The English muffins cook quickly in a pan with clarified butter (not the oven), which gives them a golden crust and buttery flavor. 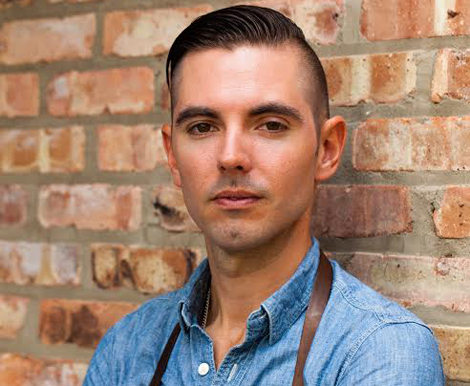 Read on to find out how Mahin achieves muffin perfection—including his “forking” secret, which creates nooks and crannies for your peanut butter, hollandaise, or cheese to melt into. Make the poolish about 12-14 hours ahead of time. 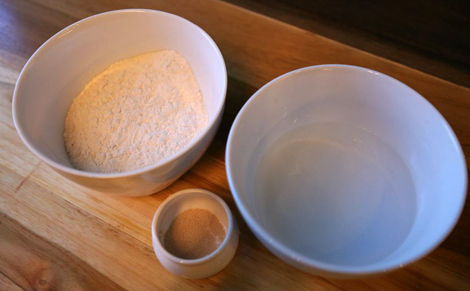 In a bowl, loosely mix the water, bread flour, and instant yeast together. When the poolish comes together, cover with plastic wrap and allow to rest for two hours at room temperature. Then, place in the refrigerator overnight to build flavor before using the next day. Knead the dough for a few minutes until it comes together and there’s no more dry flour. This will take just a few minutes. If you want to make your English muffins the next day: Cover your dough with plastic wrap and let it sit out for an hour. Then put it in your fridge overnight until you’re ready to use. If you want to make your English muffins the same day: Cover your dough with plastic wrap and let it sit for two hours, then gently remove the dough and place onto a lightly floured working surface. Press the air out of the dough and fold like you would a letter. Then press down once more before placing it back into a lightly greased bowl. Cover with plastic wrap and allow to proof for 1 hour at room temperature. Scrape the dough out onto a lightly floured work surface. Using a kitchen knife or dough cutter, cut the dough into about 35 portions, at 100 grams each. It’s smart to portion them out before slicing, like Mahin does here. Boule (or ball) the dough on an un-floured, smooth work surface. You don’t want any flour on the work surface—that way, the dough will catch on the table. You can put a little flour on your hand so the dough doesn’t stick to your palms. 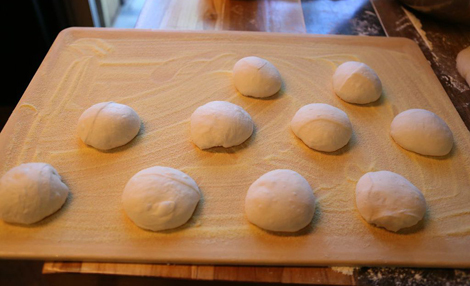 Place the balls of dough onto a board that has been dusted with semolina. Lightly cover with plastic wrap and allow to proof for 1-2 hours at room temperature. Preheat a 12″ (preferably cast iron) pan or griddle over medium heat. Add 2-3 tablespoons clarified butter. Gently remove the English muffin boules from the board and place face-side down in the pan, about two at a time (or however many you can fit without them touching). You know your pan is hot enough when you get a sizzling effect right away. Cook on each side until golden brown (about 2 minutes each side). Remove and place on a parchment paper-lined sheet pan. Cool completely before serving. Once cool, use a fork to stab around the edges of the English muffin and pull apart—this gives them texture when toasting. 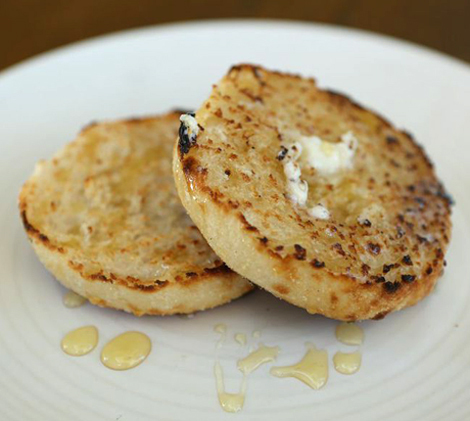 Or simply butter your English muffins and drizzle with honey. These will keep for approximately five days wrapped up in a bag.